When I came home from a long day at work today, I was hungry and wanted to cook something up; but the stove top blew a circuit. So I hopped in the car with a couple (TWO) kids. It wasn’t long into the bickerfest that I reminisced about the days when all the kids were home and chaos reigned. I had to come up with some coping skills. Back in those days when all ten were under the same roof, and there was another parent around, I created a mental device to insure my sanity. I called it Babysitter Mode. When there would be wars on multiple fronts, meals to try to prepare, laundry to diminish (because, as you know, it never ends), chaos to calm all with approximately three hours of sleep, I was about to blow a circuit or two myself. Other mothers told me stories of how they coped with their many kids. One locked herself in a bathroom til Dad came home. I know my mom’s generation had their coping skills too, and I think drinking was involved. So, in order to keep my head and sanity, I created Babysitter Mode. When things got out of hand and I didn’t have the stamina to deal with it all, I switched to Babysitter Mode, and my primary task was keeping the children from killing each other. Period. I was no longer in Mommy Mode, Good Mother Mode or even Bad Mother Mode, I was just the sitter. No dishes, some snacks, definitely no laundry. I was working until the other parent came home. There are certain rules during Babysitter Mode. Sorry, but the babysitter will not read any books to the children. Although innocent enough, she has learned that this idea will inevitably create another skirmish when a book is not agreed upon. Children can watch whatever they want on TV. Since at this time, there wasn’t cable, there weren’t many choices. A VHS tape of general interest is usually successful. Older children may play any video game except Super Smash Brothers since the brothers often confuse the game with reality. The babysitter does not help with homework. The babysitter does not give any rides. Once the peace has been established, the babysitter may find a quiet corner and read a book of her choice. The babysitter will only bathe the children if they are considerably dirty. Older children are encouraged to go to their friends’ houses, but friends are not allowed over. The babysitter will refer all conflict resolutions to the father which usually ends the conflict right there and then. The babysitter will not spell a word for anyone. I have found Babysitter Mode to be a successful coping device when things use to get out of hand. 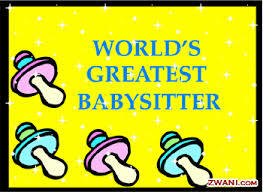 I chuckled tonight as I remembered the days of Babysitter Mode. Though things have quieted down a lot with only four kids at home, I may still switch to Babysitter Mode just for a moment alone with a book.